You find the Adventure Island Resort ideally located on the north facing bay of South Molle Island, which provides visitors with a sheltered spot in the heart of the Queensland Whitsundays that is ideal for relaxing and having fun with like minded people from all over the world. The Adventure Island Resort is an adults only resort that provides affordable accommodation right next to a beautiful white sandy beach and surrounded by swaying coconut palms. Staying at the Adventure Island Resort on South Molle Island you will instantly feel a sense of tranquility and fun that is sure to make all of your cares drift away. 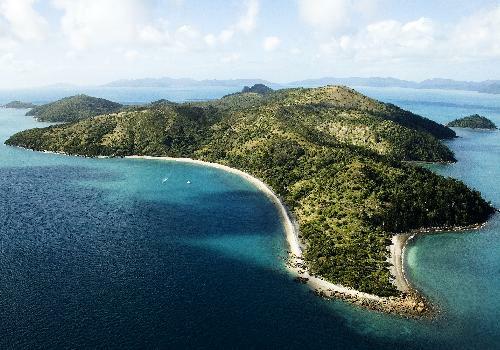 On South Molle Island holiday makers will discover a large number of great Whitsunday walks around the 400 hectares of pristine national parklands. In fact there are over 17 kilometres of walking tracks where you can get up and close to an abundance of native flora and fauna, as well as visiting lookouts with some truly amazing views across all of the Whitdsunday Passage. The Adventure Resort on South Molle is an eco friendly tropical paradise that is encircled by a spectacular reef which provides excellent swimming and snorkelling opportunities. There are also 17 secluded beaches scattered around the island for you to explore and relax on. At the Adventure Island Resort you will find a resort stlye outdoor swimming pool with awaterfall spa located next to it, 9 hole golf course, tennis courts, basketball, table tennis and plenty of night time entertainment. You can also take part in numerous land based and water activities including bushwalking around the island to some truly amazing places, beach volleyball, sailing around the Whitsunday islands, boat trips out to the Great Barrier Reef and Whitehaven beach, scuba diving, snorkelling amoungst the coral reefs, paddle boarding, fishing, windsurfing, paddle skis and much, much more.